Ready for Download Immediately after purchase. Double the Accuracy of Your Decisions! "The Decision Maker's Tool Kit has provided me with mental tools that allow me to make fast and accurate decisions almost instantly." Your decisions, choices, and judgments, and the actions that flow from them are the single most powerful influence in your life. The stream of personal choices that you make from your youngest years onward literally determines the course of your life – your ultimate success or failure, your degree of happiness or discontent, your fulfillment or emptiness. Decisions have turned the tide in virtually all the great military conflicts of every age. Wise decisions have transformed peasants to kings or queens and have turned paupers to millionaires, while foolish choices have destroyed individual lives, ruined careers and brought down the great civilizations of the past and present. Literally millions of the earth’s inhabitants have given their lives in the quest for self-determination and freedom of choice, since the very beginning of recorded history. Yet, even though we've recognized its importance for thousands of years, decision-making is an area that most people have never studied. You won't find a course on how to use your personal freedom of choice effectively or how to make good in most primary or secondary schools. Until very recently, decision-making classes were rarely found in college curricula. In fact, up until two decades ago, decision-making was a totally unexplored field, scientifically – no studies, no research, and very little data. Fortunately, all that has changed in recent years as mind scientists who were looking for some new worlds to conquer decided to take a closer look at heuristics decision-making, one of those rare areas of psychology that had been overlooked. Since then, hundreds of studies have been done that offer some exciting and occasionally shocking revelations about how we humans make decisions. In this presentation, The Decision-Maker’s Toolkit, you’ll learn how to turn these recent scientific discoveries into a set of easy-to-use mental tools, and discuss how to use them to make fast, accurate, informed, win-win decisions that will stand the test of time and increase your success in your chosen profession, your financial prosperity, and your personal satisfaction. Though some of these tools may seem simple – perhaps even playful at times – don't underestimate them. The scientific research these tools are based upon has been well established, as you will discover as you listen. And, if you will use them, these tools are capable of radically improving your decision-making skills. The first CD in this triple-compact disk presentation offers a collection of mental techniques to help you perform better in every decision-making situation you encounter by neutralizing the Seven Decision Distortions that cloud most people’s thinking. Disk Two alerts you to the Five Deadly Decisions Traps and shows you how to successfully escape or avoid them. Then, in disk three, you’ll learn effective methods for dealing with the special challenges of group decisions as well as the latest breakthroughs in creativity and it’s impact on decision-making skills. 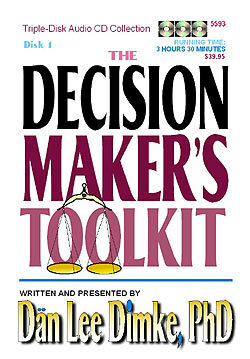 The Decision-Maker’s Toolkit offers you one of the most comprehensive decision-making courses available anywhere, in a form that’s easy to listen-to and easy to learn. Discover how quickly it can transfer your ability to make wiser, more-accurate choices.